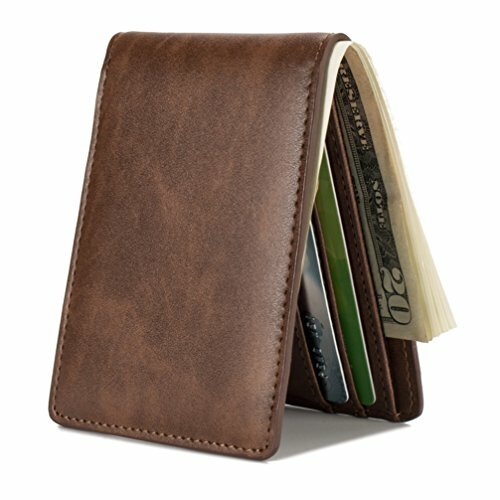 Hate having a giant bulging wallet? 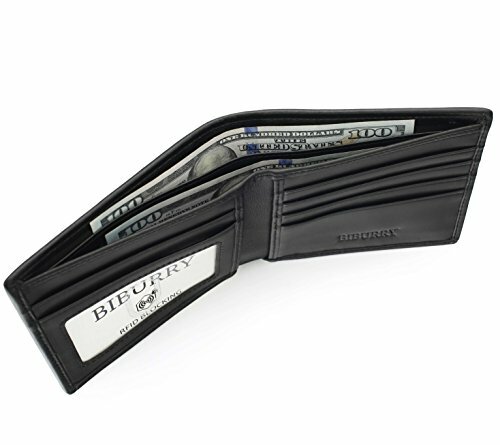 Simplify your life Start with our wallet. Minimalist designed, slim and small, Bulk Storage, durable genuine leather, looks beautiful, feels great. With RFID blocking layer, Keep your personal information safe; protect your credit/bank/ID card information from being remotely read by RFID scanners. Do not be the victim of a silent crime of electronic pickpocketing. What is RFID? - RFID: Radio-frequency identification, uses electromagnetic fields to automatically identify and track tags attached to objects. The tags contain electronically stored information. Our Credit/Bank/ID card, passport have encoded chips tags, and stored our personal/private information. So, we should protect them from information hacker and data thieves. - Data thieves can read your private data of cards at a distance of 10ft(3m), using a RFID scanner. 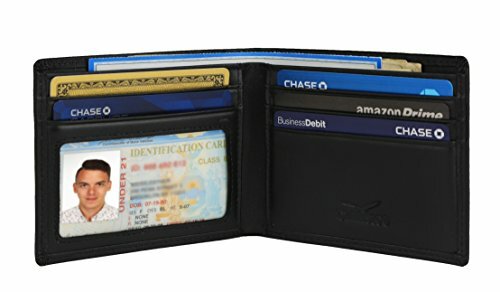 Now, this RFID signal blocking wallet can protect your personal/private information safety. - This item has built-in RFID signal blocking material layers, which can block signal from 10MHz to 30GHz. Credit/Debit/ID card, driver license, passport use the frequency of 13.56MHz. It won't block signal from ID badge, some old hotel room cards or building access cards, which use a frequency of 125 kHz. 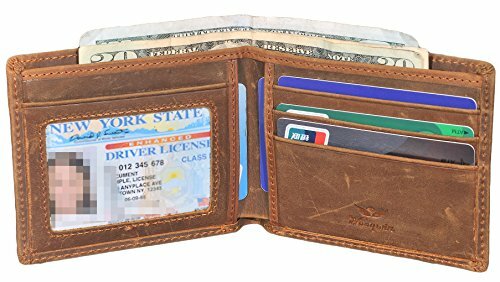 ULTIMATE SLIM: 4 1/2" x 3" x 1/2", can fit in your front pocket perfectly; FULL WALLET: 1 ID slot, 2 functional slots, 3 card slots and 1 big slot for unfolding cash; GENUINE LEATHER: high quality crazy horse leather, soft and durable; RFID BLOCKING: any RFID signal working at a frequency of 13.56 MHz will be blocked; GUARANTEED QUALITY with hassle free return or exchange. 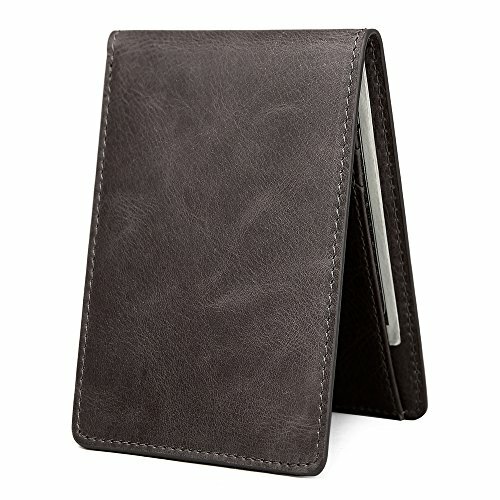 Version: The wallet is made of soft, high quality genuine leather, wear-resistant and durable with skilled line finish. The lining was made of polyester, smooth and durable. It is stylish, classic and practical. Dimensions: L*W*H: 9cm*11cm*0.7cm, it is ultra slim and easy to put into your front pocket and carry with you wherever you go. The size well fits in your back pocket much more comfortably, but the front packet is also fitting. Great item for yourself or as a gift for friends and family on Birthday, Anniversary, Thanksgiving, Christmas, and all other holidays! Construction: There are 3 card slots, 2 full bill compartments for cash, enough capacity for daily use. Easily holds credit cards, ID card and some cashes when you go out and travel, which make it convenient and suitable for daily life! ⭐⭐⭐⭐⭐ Protect your digital information with a wallet that is both safe and stylish. MANHATTAN front pocket wallet is specifically designed to block scanners from reading your RFID cards. Simply place them inside and relax. You can now rest assured that all of your information is safe. Made from top grain Italian leather, MANHATTAN looks and feels great in your hands. Its refined design is practical as well as understatedly fashionable. With space for up to 9 cards as well as bills it is slim, minimalistic and fits easily in any pocket. The external pocket allows you quick access to cash or a public transportation card. Crafted to hold US Dollars, MANHATTAN is not made for Pounds or Euros. Please check out its sister wallet, CITY, which has the ideal shape for Pounds / Euros. We trust that you will like MANHATTAN as much as we do so it comes with a 6 month warrantee. 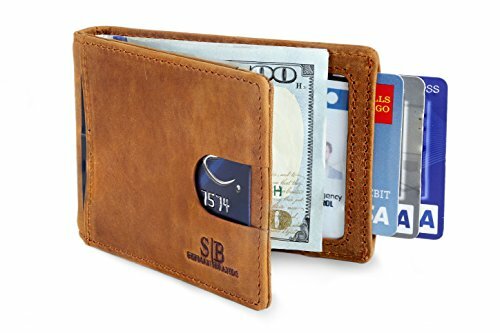 If you have any questions or comments please contact us at [email protected] Slim, sleek & lightweight Easily holds up to 9 cards and a couple of bills Card pockets RFID protected Made of soft, durable genuine top grain leather Gift packaged 6 months warranty Click “Add to Cart” to buy now! 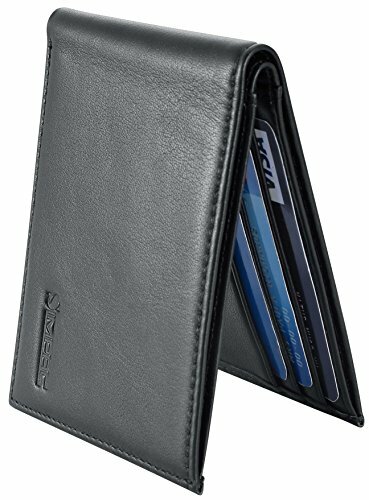 Looking for more Bi Fold Slim Wallet similar ideas? Try to explore these searches: Quartz Crystal Cluster, Open Wide Walkshort, and Kitten Pin Brooch. 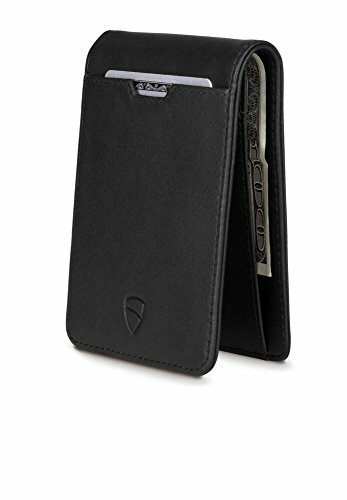 Look at latest related video about Bi Fold Slim Wallet. Shopwizion.com is the smartest way for online shopping: compare prices of leading online shops for best deals around the web. 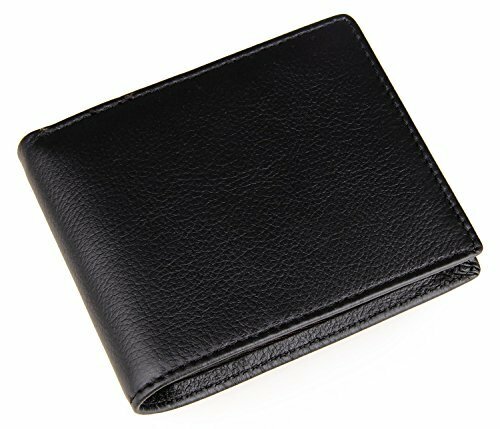 Don't miss TOP Bi Fold Slim Wallet deals, updated daily.